Ward off that gloominess in your home with some shiny new lamps! You've worked hard to furnish, decorate and clean your abode, so why not show it all off? As they say in the film and photography industries, lighting really is everything! In addition to providing soft, flattering lighting to any room, they're wonderful decorative pieces as well. Plus, they come in many different shapes and sizes to fulfill their duties all the better. 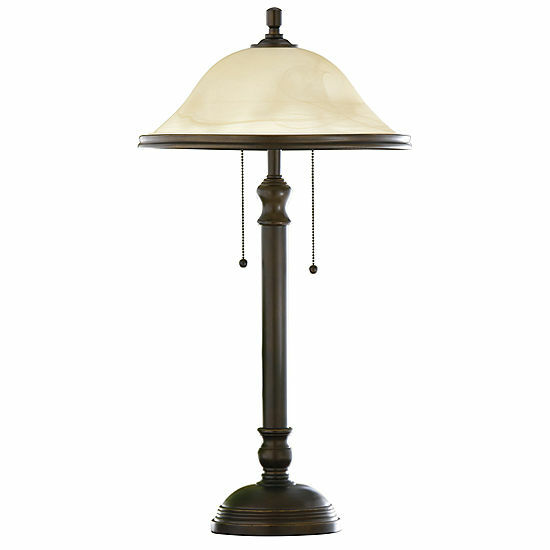 Pick up a set of table lamps wrought from cast iron and topped with striking stained glass paneled lampshades for an elegant look with a hint of rustic style. Or, fully coordinate an entire room and get your hands on a complete light fixtures set that contains floor lamps as well as table lamps. Go further and fully customize your home's new lighting by pairing your favorite type of lampshades to the appropriate lamps for a wholly unique look that's completely your own. Show off your home's personality with a set of table lamps with built-in side tables for unbeatable utility and space-saving savvy. Adding a chandelier to any room automatically amps up the glamor factor. The room transform from plain to regal in an instant. If minimalism is your style, a pendant light is right up your alley. Home decor is all about options, and in the realm of lamps and light fixtures, we've got options in spades. Whatever style you want we have it. Shop now and enjoy great savings on your favorite lighting solutions for your home!